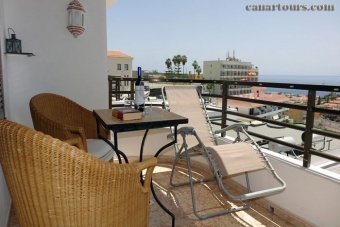 The apartment Sobre del Mar is located in Puerto Santiago. Here you find one of the best black sanded beaches on the island of Teneriffe. You will find a beautifully planted directly on the seafront promenade along with many bars, all kind of shops and restaurants. Puerto de Santiago offers 360 days of sunshine a year with an average temperature of 25° C to 28° C. Many small restaurants are waiting for you with good food. You can start from here for long walks or boat trips and, with a little luck, be accompanied by dolphins. For the fishing friends, there are opportunities for ocean fishing. Nevertheless, Puerto de Santiago is a resort where it is still introspective approaching, because the tourists swarm is not too big and the possibility for a relaxing vacation is guaranteed. Along the West Coast you can go to Puerto de Santiago, which is well known for the cliffs of Los Gigantos. The city has a large bay and a yacht basin and grows quickly into a resort. Shops of all kinds, 2 minutes by car. Beach, 2 minutes by car. SOUTH airfield about 55 minutes by car. NORTH airfield about 90 minutes by car.